Oh, Paris. Lovely, lovely Paris. The word alone is a decadent dessert, sweet off the tongue, unapologetically leaving me wanting more. Is it too soon to be planning our next trip abroad to this magical place? No such thing, and planning for our next trip (in my head) I most certainly am. While we did and saw and ate so much, this city always leaves me feeling inspired and antsy to return. “A moveable feast” Paris is indeed. 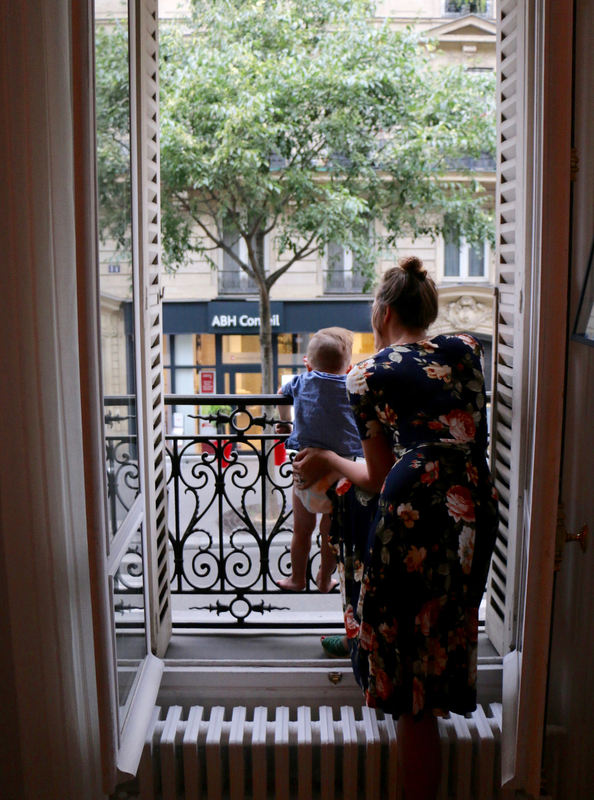 I have been in love with Paris for as long as I can remember what it feels like to be in love, and like most Francophiles I know (and know of), it’s the city’s je ne sais quoi that is to blame for our steadfast and rather over-the-top crush. It’s everything uniquely Parisian that when strung together like an well-tuned orchestra makes the most beautiful song. If you’ve been there you know. If you’ve seen photos, you can kind of get the idea. But there’s nothing like being surrounded by Paris and all of her charm to really get how this city can move you. It’s in the details too…the curved architecture, the sprawling markets, the colorful bistros, the tiny round tables, the pungent runny cheese, the crusty baguettes toted over shoulders, the casual accordion player playing, the picnics on park benches, the light reflected on the river, the golds, the beiges, the whites, the tree-lined boulevards, the freshest flowers on every table, the women in high heels, the weathered bentwood chairs, the hidden book stores, the old men in bright red suits, the babes in black buggies, the charming rooftop terraces, the single pot of lavender on a sill, the windows showing off glistening pastries, and the lovers on the corner kissing. It’s all of this, plus the air that fills your body as is brushes swiftly past a bakery and into your lungs. It’s also the feel you get when you walk by a couple sharing a bottle of wine and the goosebumps that linger, reminding you of slower times and simple pleasures. And what’s Paris without the bouncing light on the water as the Eiffel Tower sparkles at night, making everyone, everywhere, stop and sigh. Oh, Paris. All of you and your intention call my name. You make me smile the biggest smily-eyed smile, as if returning home to a place that’s always been a part of me and of my soul. Places to Roam: If you ever find yourself in Paris, walk. Walk until you cannot walk any more, find a bistro and take refuge with a glass of wine, and then get up and walk a bit more. This city, in my opinion, is best enjoyed by foot. These are some of our favorite ways to enjoy the city, roaming style. There’s no timeline and no lines to wait in. Just pure, unhurried, joie de vivre! Below is a little list of the things we loved doing while there, things I suggest you try if in the city or if visiting for a bit. 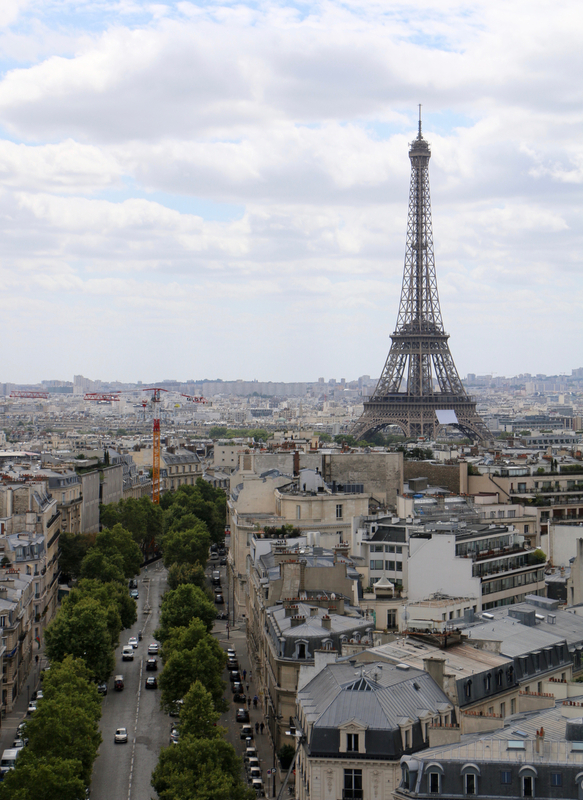 I’ve included the Arrondissement to make things easier if you’re new to the city! Porte de Clignancourt Flea Market | 18th | While staying near Montmartre the five of us ventured up several blocks to one of the biggest and best flea markets in Paris. It was about a thirty minute walk from our flat, and inside rows of venders selling commercial items we found a sprawling maze of secret passageways lined with antiques gems and treasures. We got lost walking around and exploring, and I ended up falling in love with and buying a little ol’ copper pitcher for flowers. Montmartre | 18th | Situated on a large hill in the northern part of Paris, this part of the city is one of the most lovely places to roam and wander. I recommend you spend some time at Sacra-Coeur Basilica and sit on the steps with a bottle of wine and soak up the views of the city below. Le Marais | 3rd & 4th | This very old area of the city is probably the trendiest and most diverse of the arrondissements, and I think has some of the best shopping. Visit Merci, a store with everything, and have dinner at a bistro overlooking the streets. 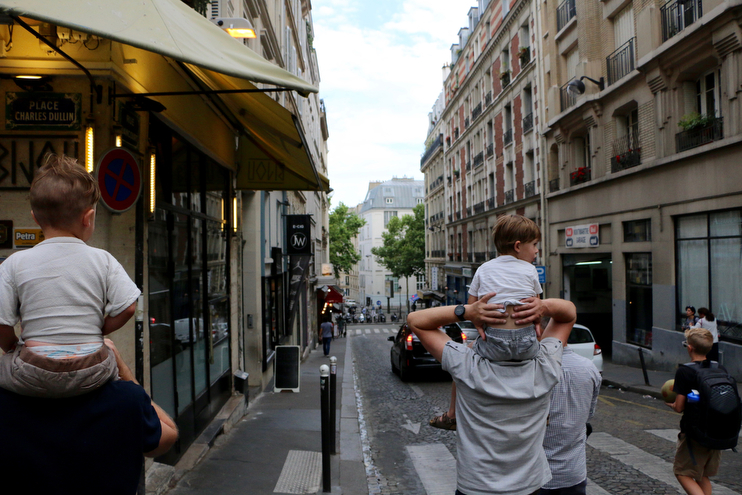 Beth over at Local Milk has a wonderful guide to the Marais, so visit her site for more ideas. Shakespeare and Company | 5th | One cannot go to Paris and not step foot into this quaint independent bookstore, which is arguably, the best in the world. You are not supposed to take photos or film in there, which everyone supposedly knows except for me, so that was fun. Oops. Alas, I came home with about seven new books and the cutest little tote bag to take on my trips to the library. I want to go back and spend a whole day there getting lost in books. Eiffel Tower | 7th | Take a long walk down the Seine and meander towards the Tour Eiffel. You can surely go to the top and get a wonderful view, but it’s not my favorite in the city. Walking underneath it will, however, take your breath away. It’s more grand and amazing in person, so you’ll have to walk around it and spend some time in the park nearby to see and feel just what I am talking about. For views of the city, I’d head over to the Arc de Triumph and climb the stairs to see heart of Paris and the breathtaking boulevards from high up. Trocadéro | 16th | Another show-stopping view that we love is Trocadéro. The rush you get when rounding the corner and coming face to face with the Eiffel Tower is like nothing else I’ve experienced. I recommend you go to the play ground nearby if you have little ones, our kids loved it! Les Invalid | 7th | Andrew’s brother used to live in the 7th and the last time we were in Paris we spent a lot of time in these gardens nearby watching the old men play pétanque. There are a lot of wonderful places to eat in this neighborhood, but my favorite is Le Malabar. We went there on my birthday and I had a glass of champagne. It was a delicious stop in our walking adventure. Saint Germain and Jardin du Luxembourg | 6th | This park is another good one to take a picnic too. We grabbed wine, meats, baguettes, and cheese and made our way there to watch the kids sail boats. It’s iconic Paris and really lovely. Museums | The museums in Paris are wonderful and rather abundant, a must-do even if you’re not an art lover. While my list of museums to visit should probably include the famous Louvre, it doesn’t. My two favorite museums are hands down Musée Rodin (including the sculpture garden) and Musée d’Orsay. I am a big fan of both impressionist art and sculpture, so both of these make my heart really happy. Bateau Mouche | Our whole family took a dinner cruise on the Seine on evening and it incredible. I know it sounds touristy, but do it. There’s nothing more amazing then seeing the Tour Eiffel light up while eating dessert. A Bit More… | Then there are other well-known things one must at least see while in Paris: Notre-Dame de Paris and Sainte-Chapelle for gothic architecture | Avenue des Champs-Élysées for shopping | Latin Quarter for amazing restaurants | Moulin Rouge for nightlife | Palais-Royal Gardens for a quiet afternoon off the beaten path. I think that about covers it but if I think of any more Parisian treats, I’ll be sure to let you know. Now your turn, and Paris locals feel free to chime in, what are your must sees, dos, and places for wandering? Merci! Loved reading this post. Paris is truly so lovely. Totally agree that it should be explored by foot. All the streets are captivating! I visited Paris for the first time back in April and would love to return and explore more. Although I live close (5 hours drive) I never go there no more lately. I used to go there every year, when I was a teenager, but lately it has been a while. Time to go there again. But we would avoid the centre and Eiffeltower. Don’t know what we would do instead, but I think just enjoying the city and eat as much as possible the lovely food there. What a beautiful post you’ve wrote about Paris. I felt your love for the city and it brought me back to the time I leave there. Oh la nostalgie..! Now I most go back with some of your suggestions on hand. Also, may I suggest you a tiny correction about your French I think you meant to say a little “je ne sais quoi”. I don’t think it really matter to most of your reader, but the French ones ;-).